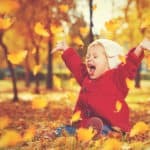 If you have a toddler, you’ll have your hands full! But if you have a young baby too, getting out and about together can be a challenge. Of all the baby gear you’ll buy, a stroller can be one of the most expensive items you’ll need. So, it’s vital to make the right choice the first time. One way to travel with both your children is by using a sit-and-stand stroller. Sit-and-stand strollers come in tandem style. There’s a front seat for the younger child and a back bench seat and standing area for the older sibling. Parents typically prefer sit-and-stand tandem strollers over side-by-side double strollers, firstly because the older child has more freedom to walk when they want to, and secondly because tandems are easier to maneuver than side-by-side strollers. For a full, in-depth comparison of side-by-side and tandem strollers, check out our informative article. In this guide, we compare two of the most popular sit-and-stand strollers that are currently on the market, the Joovy Caboose and the Graco RoomFor2, to help you decide which of these great strollers would suit your situation and budget best. 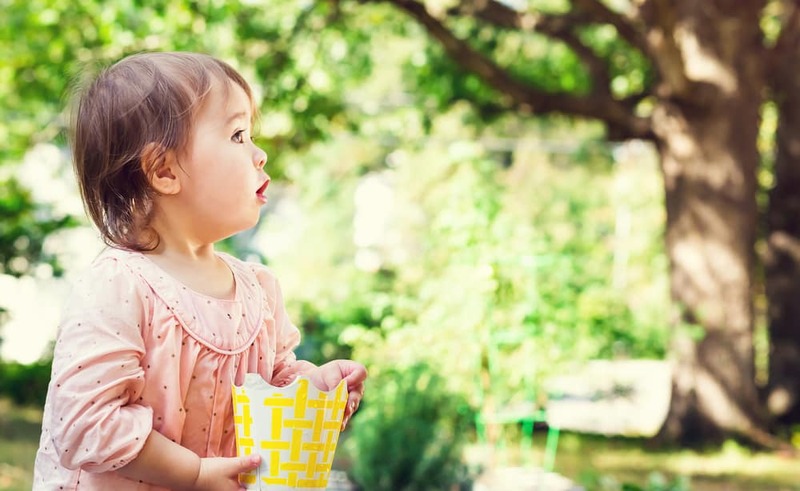 Joovy is a relatively new kid on the block in the children’s gear marketplace. 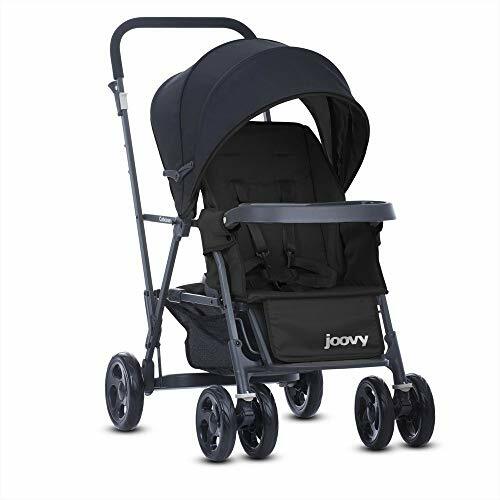 Based in the U.S. in Dallas, Texas, Joovy manufactures a broad range of products, including high chairs, play yards, toys, strollers, and bike trailer strollers too. Joovy’s design team are all family people with their own kids, so they’re all too familiar with the challenges that are faced by parents, especially those with more than one child. Therefore, it’s no surprise to discover that their strollers are robustly built, practical, and have a distinctive, stylish look too. The Caboose Graphite is pretty lightweight at just 28 lbs. The stroller’s capacity is generous, being able to hold up to 90 lbs, split evenly across the front and back of the vehicle. The Caboose measures 37” W x 21.5” L x 41.5” H, so it will comfortably fit through standard store doorways and aisles. The front seat has three recline positions, and the rear passenger can sit or stand looking backward or forward, depending on their mood. Also, although you’ll need to buy most of the accessories separately, that does allow you to ensure that everything is to your taste, and you won’t finish up having to store stuff you don’t use. You can check out the Joovy Caboose Graphite in action in their official promotional video at this link. The lack of included accessories is where the Caboose disappoints. You don’t get standard items such as a cup holder or a parent’s organizer that are usually included with other comparable brands. Accessories are available, but you have to buy them separately. Also, the stroller’s handlebar is shaped so that generic accessories and other brands’ products don’t fit. The basic seat is comfy and roomy enough for a small child or baby. However, if your children are close together in age, you might want to buy the Caboose rear seat, which turns the rear area into a forward-facing reclining seat. The sun canopy is a good size and gives protection to a large area, keeping both your children safe from the risk of sunburn or from being dazzled while the seat is reclined. In comparison, the Graco RoomFor2 has a canopy that only covers the front passenger. Folding can be done with one hand and is really simple. Once folded, the stroller takes up very little room, although it isn’t self-standing. The Caboose has sealed-bearing wheels, making for a smooth ride for your passengers and an easy push for you. There are harnesses for both the front and back seats, so you have the peace of mind that both your children are buckled in and safe. The Caboose’s brakes are linked. That means only the rear brakes are connected, making it easy to stop the stroller quickly in an emergency. A single lever operates the brakes, so engaging them is quick and straightforward. In comparison, the RoomFor2 has a non-linked system, so applying the brake is more time-consuming. The underseat storage basket is a pretty reasonable size, but it’s awkward to access quickly. If you want to improve the storage space on the stroller, you’ll need a parent’s organizer, and you have to buy that separately. Graco was first formed in Philadelphia in the 1950s by an engineer, David Saint. Saint was inspired by the wife of a colleague who soothed her cranky baby by swinging him in their backyard glider swing. This simple act prompted Saint to design and create a whole range of strollers, car seats, cribs, swings, and other baby and child products. Graco uses modern patterns and colors that are designed to complement your home décor, and contemporary, striking designs are sure to turn heads as you push your children in your stroller. Despite the budget prices, Graco places their emphasis on comfort for you and your child. The most durable fabrics are used to create comfy, padded seats, and Graco strollers are designed to be easy to push and fun to ride in. The Graco RoomFor2 sit-and-stand stroller has a slightly larger weight-carrying capacity than the Caboose, taking two children up to 50 lbs each. The stroller is slightly larger too, measuring 34.6” W x 20.8” L x 40.1” H, and weighing in at a little over 27 lbs. The seating layout is standard for a tandem sit-and-stand stroller; the older child sits or stands in the back of the stroller, while the baby or infant rides in the front seat. You don’t have the rear seating option that you get with the Joovy Caboose. 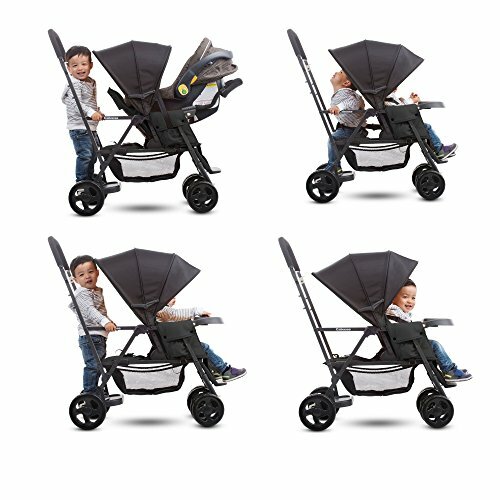 The RoomFor2 is compatible with a car seat, but you may find that this takes away the seating room in the back of the stroller, so your child would have to stand. You can see a video of the Graco RoomFor2 in action at this link. The RoomFor2 comes with accessories that you don’t get with the Caboose, including a parent tray and a child tray for the front passenger. The front tray is movable and pivots outwards, making it easy for you to take your baby or infant in and out of the stroller. The parent tray has two cup holders and space where you can keep your keys, phone, and perhaps some cash. 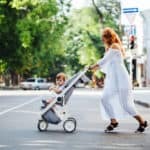 That’s such a bonus, allowing you to enjoy a coffee during your stroll without juggling your cup and trying to push the stroller with one hand. Most double strollers don’t have enough room for child trays, but the RoomFor2 is an exception. The child tray has room for sippy cups, bottles, and snacks too. Even better, the tray swivels open for easy access to the seat. The RoomFor2’s sun canopy is a good size for the front child, but unfortunately, it doesn’t reach the back and isn’t as generous as that of the Caboose. The seat is well-padded and comfy, as is the rear bench. The seat cushion is machine washable and can be line-dried without damaging the fabric or the padding. There’s a five-point harness for the front seat, which is more than you get with many similar strollers that only provide a three-point harness. Like the Caboose, you get a three-point harness for the rear bench seat. A nice touch that’s lacking on the Caboose is two riding handles on the rear of the stroller, which are designed to prevent the standing child from falling if you hit a bump in the road. The front seat takes any Graco car seat, allowing you to have a complete travel system for a new baby. The seat also features a multi-position recline that includes completely flat, making the stroller suitable for a newborn. The brakes are easy to engage, so you can stop the stroller on a dime if you need to. Unlike the linked braking system on the Caboose, the RoomFor2 has a two-step set of brakes, meaning that you’ll need to engage the brakes on each set of wheels to lock each one. The underseat storage basket on the RoomFor2 is pretty generous and is quite a bit larger than that on the Caboose. Access to the storage basket isn’t the easiest, and that’s where the parent tray comes into its own. The parent tray is included with the stroller and will comfortably hold your keys, wallet, phone, etc. Items such as diaper bags, coats, etc., can be placed in the underseat basket. Like the Caboose, the RoomFor2 has an easy, one-handed fold feature, and an auto-lock is included so that the stroller frame can be secured for quick, compact storage. The RoomFor2 gives a pretty smooth ride on flat surfaces, but it can be a bit bumpy over grass or gravel. Steering is easy and effortless thanks to the design of the stroller and the large tires. 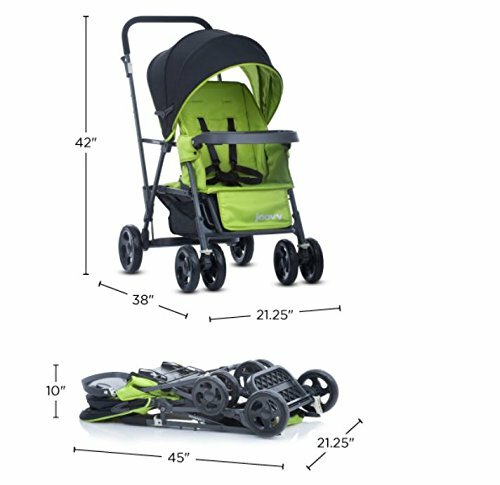 The RoomFor2 includes several important safety certifications, so you can relax knowing that your family is safe when riding in this stroller. The stroller is JPMA Certified and meets all ASTM standards. When it comes to value for money, you certainly get more bang for your buck with the Graco RoomFor2 than you do with the Joovy Caboose. Both strollers are well-made and look great, but Graco has included many great accessories that you have to purchase if you choose the Caboose. Both the Joovy Caboose and the Graco RoomFor2 are nice quality, double sit-and-stand strollers that do the job very well. 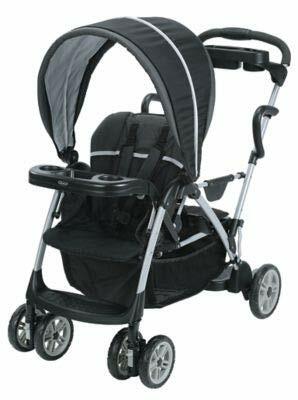 The materials and design used to create both these tandem strollers are top of the range, and the ride quality is comparable too. However, there are a few differences between them that could be deal-breakers for you. First of all, there’s the glaring lack of accessories included with the Caboose. You even have to pay extra for a cup holder! Compare that with the extras you get with the RoomFor2; cup holders, parent tray, child tray, extra storage space, etc. That’s surprising, considering that the Caboose is the more expensive of the two strollers. That said, the Joovy Caboose offers you the versatility of adding a seat to the rear of the stroller that you can’t do with the RoomFor2. Also, the Caboose has a super-sized canopy that offers shade to both passengers, where the RoomFor2 only gives coverage to the front passenger. So, there are pros and cons to both these strollers. If you have a little more to spend and you don’t mind buying all the accessories separately, you may want to choose the Caboose. For a more all-inclusive, budget stroller, check out the RoomFor2.